Orenco’s AdvanTex® Treatment Systems provide affordable, scalable wastewater solutions for businesses of all sizes. From campgrounds and resorts to restaurants and wineries, our technologies are used worldwide by businesses that need low-maintenance solutions to their individual wastewater needs. And our updated AdvanTex Design Criteria is an excellent resource for designers and engineers who create custom wastewater treatment systems for commercial projects. Wastewater projects for resorts and hotels have one thing in common – they need a highly effective wastewater treatment system despite variable seasonal flows. Whether the project requires exceptional treatment, odor control, rapid deployment, minimal operation and maintenance, low life-cycle costs, or all of the above, Orenco’s treatment systems are a proven, economical solution for the hospitality industry. A huge benefit offered by AdvanTex over other treatment technologies is its reliable performance, even under highly variable flow conditions. Many resort properties experience extremely low flows during the off-season. Unlike some other technologies, AdvanTex is capable of consistently meeting stringent limits without performance degradation due to these variable flows. Whether an existing system needs to be replaced or a new resort project requires a wastewater system, AdvanTex offers solutions to meet your budget. Orenco’s technical support staff understands the need to carefully evaluate long-term operating and maintenance costs, as well as up-front capital costs. Low power consumption, equipment durability, and ease of operation and maintenance make AdvanTex Treatment Systems an efficient, budget-conscious choice. Choosing a wastewater system for resorts and hotels involves many unique considerations. For more than 30 years, Orenco’s engineers have helped property owners and system designers overcome these challenges to ensure reliable, low-impact solutions. Designing wastewater systems for campgrounds and RV parks is challenging. After all, what kind of a system can offer the process stability to treat the high-strength wastewater that surges through the system during good weather and slows to a trickle during bad weather? Orenco’s packed-bed filter treatment systems have been successfully handling campground flows for decades, at more than 250 seasonal facilities around the world. These include campgrounds and RV parks, but also visitors’ centers and freeway rest stops. Fortunately, AdvanTex Treatment Systems are uniquely capable of dealing with a campground’s seasonal closure in a way that ATU’s (aerobic treatment units) simply can’t. AdvanTex’s low-horsepower pumps operate intermittently, which means low power bills. And AdvanTex operates quietly, so campers’ experience with the natural surroundings won’t be disturbed. Orenco’s engineers have helped design wastewater solutions for more than 150 campgrounds throughout the world. Whether your project is a commercial campground, church camp, or state park, Orenco’s Engineered Solutions group is ready to help. Mobile home parks are ideal applications for Orenco (effluent-only) Sewer technology used in a “cluster” type of configuration. Using effluent sewers lowers impact on the overall park, and gives maintenance personnel an advantage when managing solids and diagnosing problems with occupants. When paired with AdvanTex treatment, effluent sewers keep overall system maintenance simple. Depending on the area, some projects are able to use AdvanTex-treated effluent to supplement landscape irrigation. Orenco Sewer and AdvanTex treatment make good economic sense, especially for park developers looking to purchase lower-cost land located away from existing centralized sewer. Our technology can be installed quickly, compressing the time from development to rent recovery. Also, the on-lot portion of the system can be installed as your park expands, meaning capacity doesn’t have to be added (or paid for!) until it’s needed. Maintenance needs of an Orenco Sewer or AdvanTex Treatment System are minimal and simple. And with our telemetry TCOM control panels, a maintenance operator can monitor the system remotely. Also, since each mobile home site will have its own on-lot tank, any abuses to the system remain in the homeowner’s own tank, minimizing negative effects on the rest of the system. Orenco’s collection and treatment technologies are great for collecting flows from subdivisions surrounding golf courses, and then treating the wastewater to levels that allow it to be reused for course irrigation (subject to local regulations). AdvanTex units can be used to service a clubhouse or a remote comfort station on the back nine. Or they can be part of an Orenco (effluent-only) Sewer system that services the clubhouse plus a thousand surrounding homes, with the super-clean effluent used for irrigation. The wastewater from your clubhouse can become a valuable resource; the treated effluent can be used for golf course irrigation and landscaping. In addition to conserving highly treated, expensive drinking water, wastewater reuse limits the release of nutrient-rich wastewater into environmentally stressed rivers and streams. Treated to advanced standards, the clear effluent from an AdvanTex Treatment System can also be reused to make artificial snow at ski resorts. An AdvanTex Treatment System can make raw wastewater up to 98% cleaner, meeting stringent regulatory requirements. * The U.S. EPA has guidelines for wastewater reuse, but interpretation of these guidelines varies from state to state. Our engineers and dealers can help walk you through system design, as well as discuss issues related to regulations, permitting, and monitoring. Orenco’s wastewater treatment systems have been installed at nearly 60 wineries throughout the world, from California to New Zealand. We’ve learned plenty about the winemaking process since our first system was installed at a California winery in 2002. 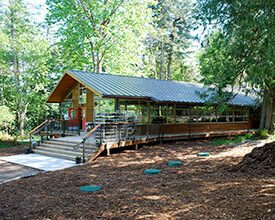 Dozens of wineries later, Orenco’s wastewater treatment systems serve visitor hotels and tasting rooms, as well as process water facilities — from crush through fermentation, clarification, filtering, and bottling. Because of its high strength and surge flows, winery process wastewater requires ample primary tankage followed by a robust secondary treatment system. 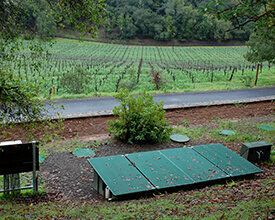 Commercial AdvanTex® Treatment Systems use a multiple-pass, packed-bed wastewater treatment technology that’s well-suited for winery applications. Orenco’s white paper on wastewater design for wineries can help you get started. Please contact our engineers to request a copy, as well as further design assistance. For more than a decade, Orenco’s AdvanTex® technology has provided a reliable, energy-efficient alternative for wastewater treatment in some of the world’s most remote places. The AdvanTex AX-Mobile™ is Orenco’s most portable treatment plant yet. Think of it as a “mini” onsite treatment facility, ready to go wherever you need it to go. Tanks range from 14-42 feet (4.3-12.8 m) long and can be installed singly, serving up to 250 people, or in multi-tank arrays serving 3,000 people or more. The system is installed above-ground, so it can be used temporarily and then relocated, as needed. And after AdvanTex treatment, the resulting effluent can be reused for dust control, irrigation, or discharge via surface or subsurface dispersal (subject to local restrictions). Portable: Ship by truck, rail, container, or aircraft. The AX-Mobile is internally pre-plumbed at the factory. Set, connect pipes, wire, and go. Modular: 14 ‘-42’ ft tanks (4.3-12.8 m) are installed singly or in multi-tank arrays. Versatile: Install above ground and relocate later, or choose in-ground installation for permanent applications. Easy to set and operate: No advanced operator license required. 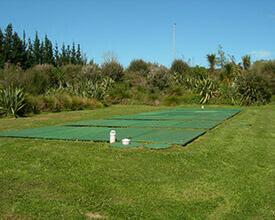 Sustainable and energy-efficient: 1-2 kWh per 1000 treated gal. (3785 L).